Webcams are often regarded as vapid little white balls with a lens plunged into its center. 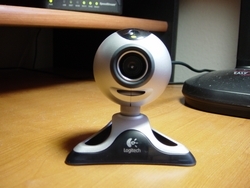 Visually, the Logitech QuickCam Pro 4000 does nothing to shake this perception. Despite its innocuous appearance, this webcam is not a knock-off; packing such features as high-resolution still-shots, a built-in microphone, and motion-detection software, the QuickCam Pro is nothing short of a high-end, we-cut-no-corners webcam.